With protest suspended, what happens next with the Dakota Access pipeline? After months of protest and months of construction on the Dakota Access Pipeline, parties with vested interests in the pipeline are wondering what’s next for the project now that it won’t cross under the Missouri River anytime soon. The Army Corps of Engineers on Sunday denied a permit to complete that segment of the line in North Dakota. For thousands of Native Americans and climate activists who have joined the Standing Rock Sioux’s protest against the pipeline, and are camped out in blizzard conditions, the question is — should they leave or should they stay? At the same time, the oil industry and legal experts are trying to make sense of the decision and what it means for the longterm project’s fate. The severe winter weather that pummeled North Dakota soon after the decision was announced prompted Standing Rock Chairman Dave Archambault to implore supporters to leave the frozen encampment along the border of the reservation. In a message broadcast on YouTube, he thanked protesters for their support and explained that construction on the pipeline was stopped. “I’m just asking that you hear this message and that you understand that nothing is going to happen, that it’s time and it’s OK to go home,” he said. But that’s easier said than done. The blizzard caused thousands of protesters to seek refuge at nearby shelters and hotels. Still, many say they are not planning to follow Archambault’s directive. Morning Star Gali of the Pit River Tribe in California stayed at Standing Rock’s casino during the storm. She noted that the pipeline company has not yet packed up its equipment and left. “Until that occurs, there’s many water protectors that have said it’s not over yet, and we plan to be here until that happens,” she said. She said she plans to return to the camp with her 13-year-old and toddler in tow. Law enforcement will also continue their work around the protest camps. North Dakota has authorized up to $17 million in emergency services funds to cover the costs of policing the protests. Capt. Jesse Jahner of the Cass County Sheriff’s Department has made many trips to protest areas from his home three hours to the east. He hopes the Corps’ decision will allow him to spend more time at his home base. “If not getting the easement allows a time where people can cool off, people can go home, they can relax and we can avoid those confrontations, that’s great,” he said. Meanwhile, the oil industry and government officials are contemplating the pipeline’s future. The Corps is launching a more thorough review of the project, considering alternate routes. 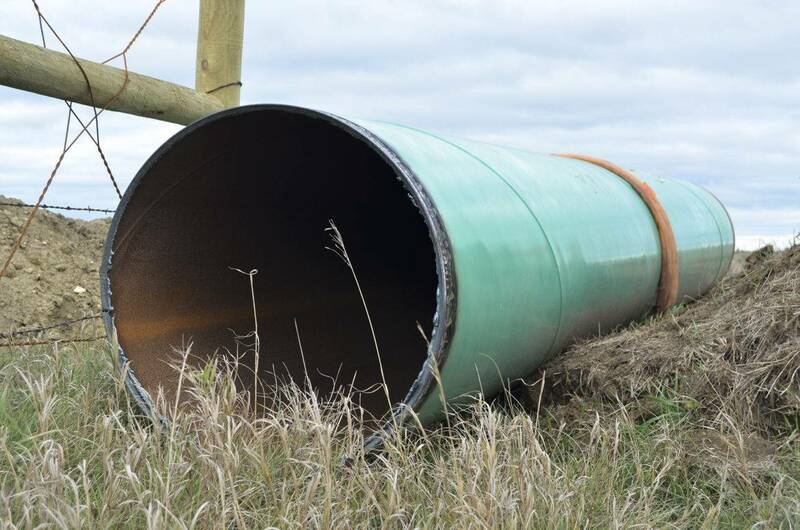 But with more than 90 percent of the line complete, and pipe already laid right up to the Missouri River, a reroute is likely to cost pipeline company Energy Transfer Partners billions of dollars. One alternative the Corps will consider is a proposal scrapped early on to build the line under the river north of Bismarck. Pipeline supporters don’t see the sense in revisiting that option. “For them to look at this route that was already disqualified years ago is I think absurd,” said Craig Stevens, a spokesperson for the Midwest Alliance for Infrastructure Now. Launching the new review will include a full environmental impact statement. It’s unusual for an EIS to come this late in the game. Wyoming-based energy and environmental attorney Karen Budd-Falen called it unfair. She said the pipeline company, Energy Transfer Partners, assumed it had the go-ahead to build after the original, but less detailed environmental assessment. “To have the company spend all that time and all that money just to have the federal government go, ‘Oh, just kidding, you can’t start it all yet,’ is a huge economic cost for the company,” she said. It also costly for the state’s oil industry. These severe winter conditions pose problems for the 30 percent of North Dakota’s crude that’s carried on trucks and trains, said Ron Ness, president of the North Dakota Petroleum Council. They are a more expensive mode of transport than the pipeline, which was supposed to be operational by now. The industry and pipeline proponents are hopeful Donald Trump will reverse the Corps’ decision when he becomes president. But legal experts say it’s not so simple. Energy Transfer Partners is already challenging the Corps’ decision in court. It filed documents earlier this week asking a judge to affirm that it already has the necessary permits to drill under the river without the final easement from the Corps. Hear the radio story here, from Inside Energy.